What began as a simple match in the Ring of Thrones tournament, NCW Champion Lumberjake and Maine State Posse ringleader Alexander Lee’s back and forth has evolved into one of the most bitter rivalries in NCW today after Lee intentionally got himself disqualified at NCW Red, White, & Bruised during their Heavyweight Championship Match all with the intention of cutting the hair and beard of Lumberjake. While The Halftime Show attempted to make the save only to get blindsided by The Posse it was Senior Official Redd Roche who attempted to thwart Lee, putting himself right into the line of fire and getting his hair chopped off by NCW’s first Triple Crown Winner. 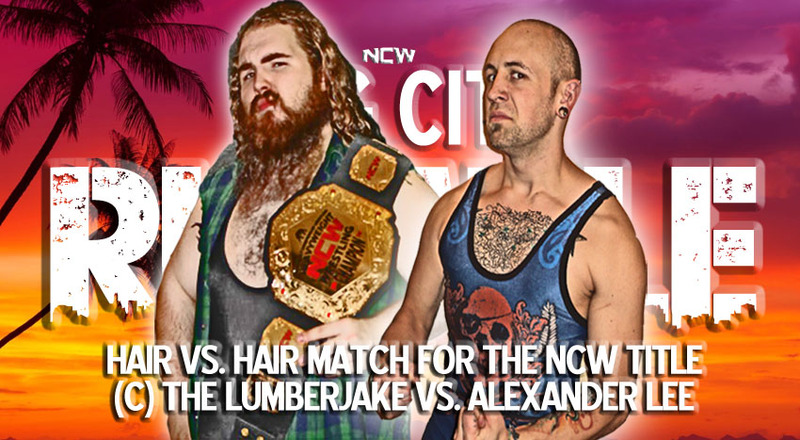 A furious Jake demanded another chance to get his hands on Lee, not only offering another NCW Title Match but also offering his hair on the line under the condition that if he wins they get to shave Alexander Lee’s chest hair in the middle of the ring. 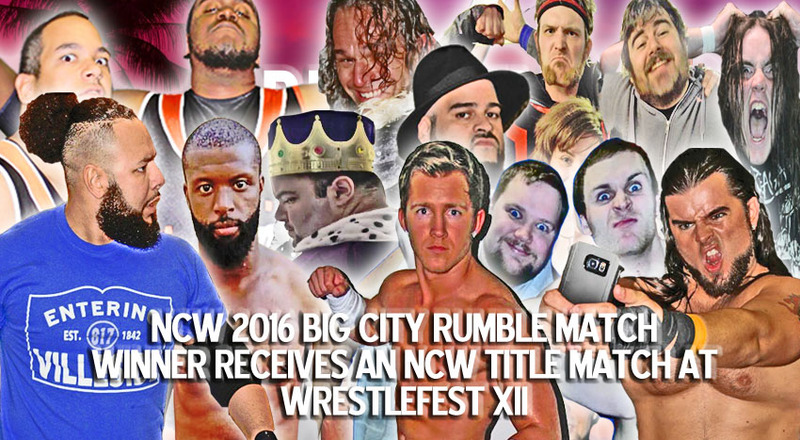 Paying homage to WWE’s Royal Rumble, the Big City Rumble Match has become one of the premiere attractions in the NCW Season. This will be the 12th Big City Rumble since its inception in 2000 where Tim Kilgore won the first Big City Rumble for the vacant NCW New England Championship. On August 26th everyone will be looking for the opportunity to enter this years Rumble and earn an NCW Championship Match November 18th at WrestleFest XII. On August 14th, 2015 at the 2015 Big City Rumble CrossFit did the unthinkable when they defeated The Loomis Brothers to win the NCW Tag Team Championship after Dan Terry used a loaded mask to knock out David Loomis and steal the match. 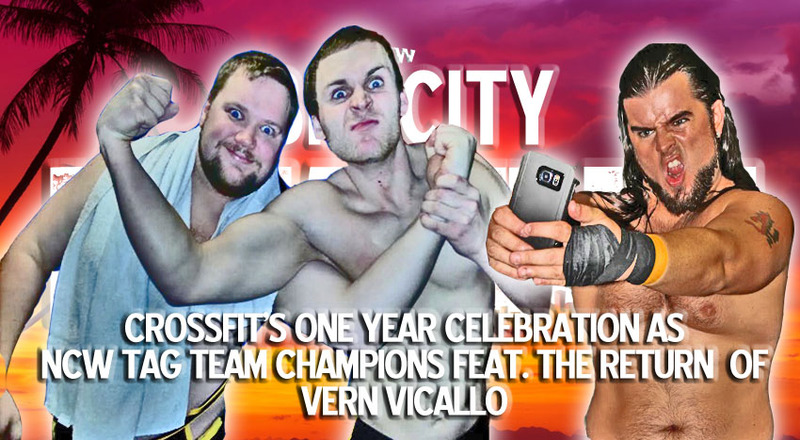 “The Selfie-Made Man” Vern Vicallo joined the CrossFit cause that night in helping Terry win, uniting this egotistical group in in their fight to dominate the NCW tag team division. One year later and still your NCW Tag Team Champions– CrossFit. Retaining their titles by any means necessary against the tag teams in NCW. 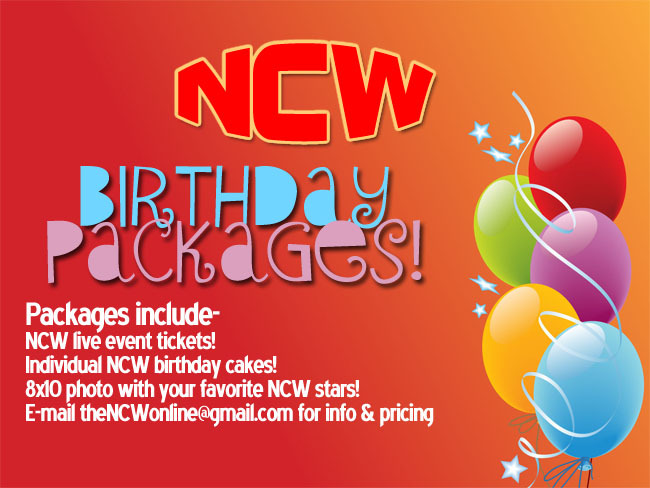 Dan Terry, Vern Vicallo, and “The Prettiest Man” Derek Andrews have promised to celebrate August 26th in style, with all of their devoted fans by their side. The Cartel or not the Cartel? That is the question. After getting an offer he couldn’t refuse at NCW Red, White, & Bruised by “High Class” Rich Bass, “The Dan Ram” Danny Ramirez walks into his second opportunity to become New England Champion with a lot of pressure on him. 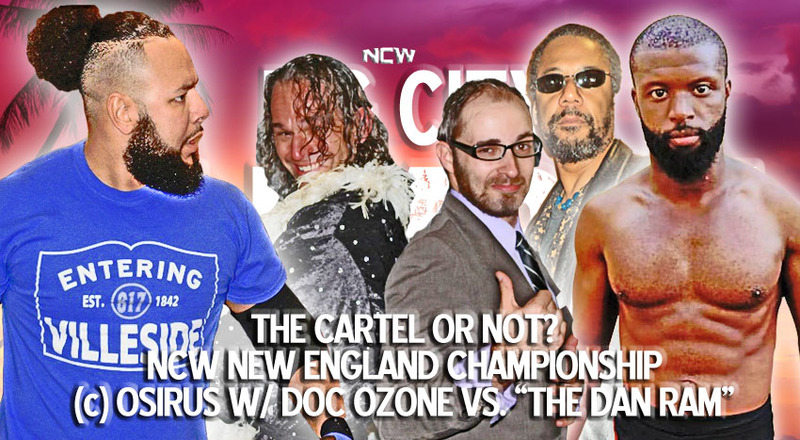 While Ramirez nearly won the New England Title at the 19 year REUNION against Osirus on his own, having Bass and The High Class Cartel in his corner could seal the deal for his victory. On the other hand selling your soul to the Devil may not be worth it for Ramirez, who’s shown himself to have great respect for not only Osirus but the New England Championship itself. Since debuting at the Friday Night Fights in April by Alexander Lee’s side, Aggro and DangerKid have done everything in their power to make life hell for Rob “The Giant” Araujo and “The Showoff” Mike Paiva. 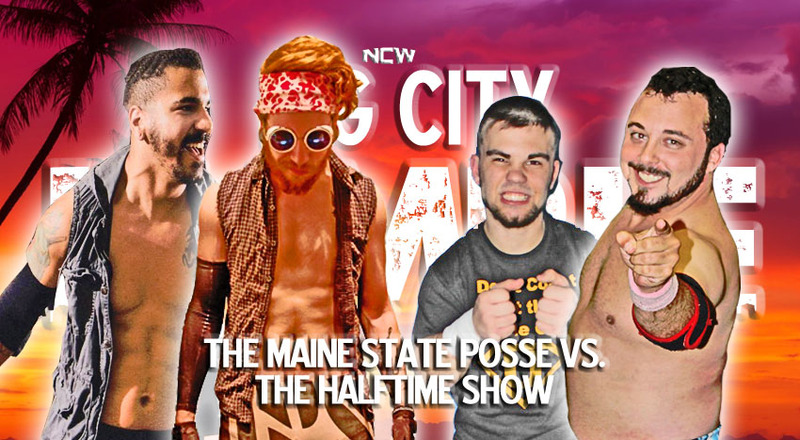 Was it because The Halftime Show defeated The Maine State Posse in their NCW debut? 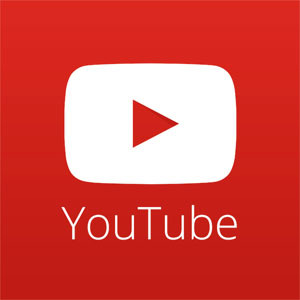 Is it because of Mike Paiva’s friendship with Lumberjake? Whatever the reason The Posse have gone out of their way to bring the pain to Paiva and Araujo, but August 26th the two NCW veterans get ready to give it back in spades. 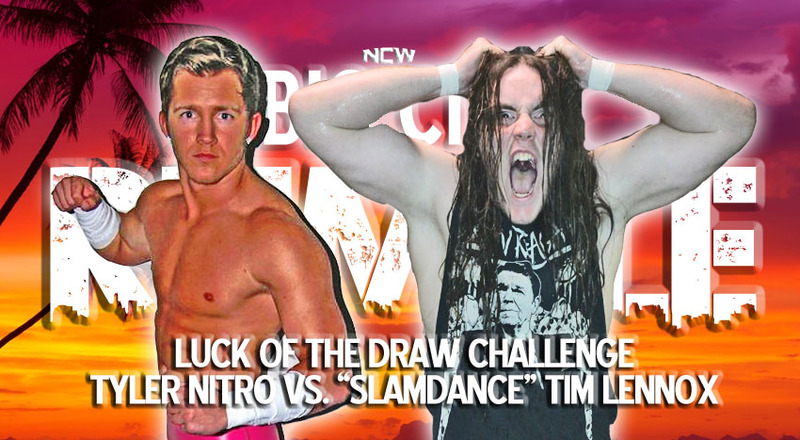 It’s the Luck of the Draw August 26th when the high-flying Tyler Nitro goes one on one with The Underground Anarchy’s “Slamdance” Tim Lennox as both men vie for the final spot in the 2016 Rumble Match. Unfortunately for the losing combatant, they will have to kick off the night as the #1 entrant in the Big City Rumble, stacking the odds against them when facing off the entire NCW roster for the chance to go to WrestleFest XII. After Red, White, & Bruised The Heavy Hitters declared they weren’t playing around anymore as Frank Champion and Shay Cash desired to get themselves back into title contention after getting screwed by CrossFit in April. To get themselves back into title contention they also know they have to conquer all their demons, including the team that beat them in the Ring of Thrones tournament (and would go on to win the whole tournament) Zero Tolerance. 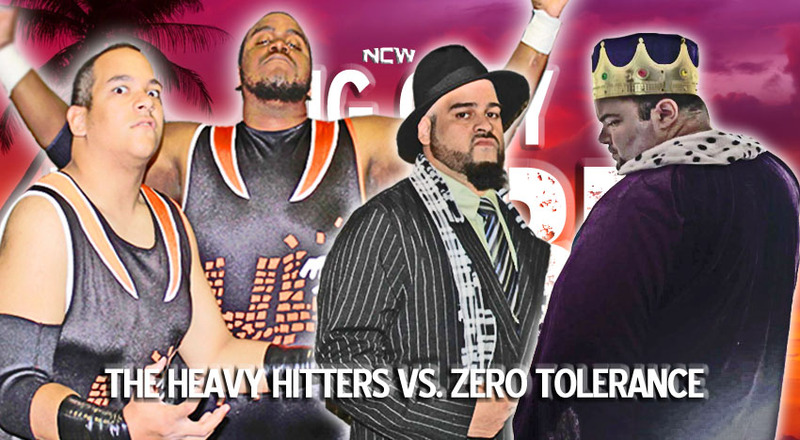 Zero Tolerance has never been stronger, with Triplelicious boasting about eliminating Bryce Clayton from NCW while Ruy Batello has discovered his royal bloodline while traveling home to Portugal. Getting by Zero Tolerance will be no easy task for The Hitters August 26th in Norwood.